Early medieval poetic sources mentioned Rheged as one of the kingdoms of the Hen Ogledd (Old North), which pertained to a Brittonic-speaking region comprising parts of northern England and southern Scotland. And while the borders of this elusive kingdom are not specifically talked about in the poems, scholars have long speculated that the ‘Dark Age’ kingdom was based in Cumbria, northwest England. 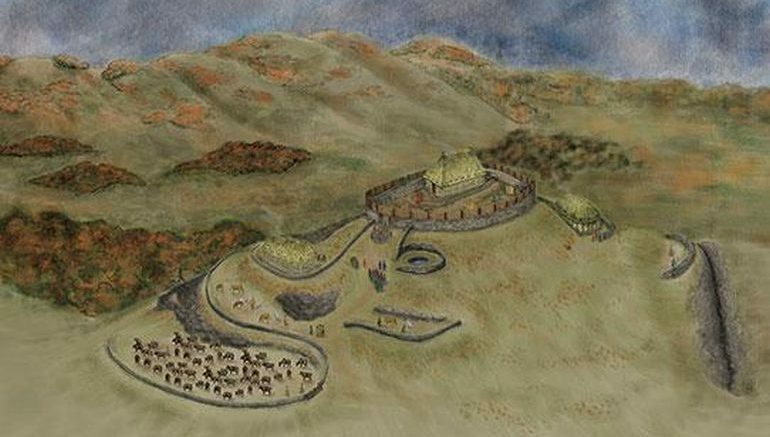 Fast forwarding to 2012, archaeologists carried out excavations at the Trusty’s Hill, which in itself lies in proximity to Galloway in southwest Scotland. To their pleasant surprise, researchers were able to discern remnants of what might have been a stronghold from Dark Age Britain – after 1,400 years. This is a type of fort that has been recognized in Scotland as a form of high status secular settlement of the early medieval period. The evidence makes a compelling case for Galloway being the core of the kingdom of Rheged. 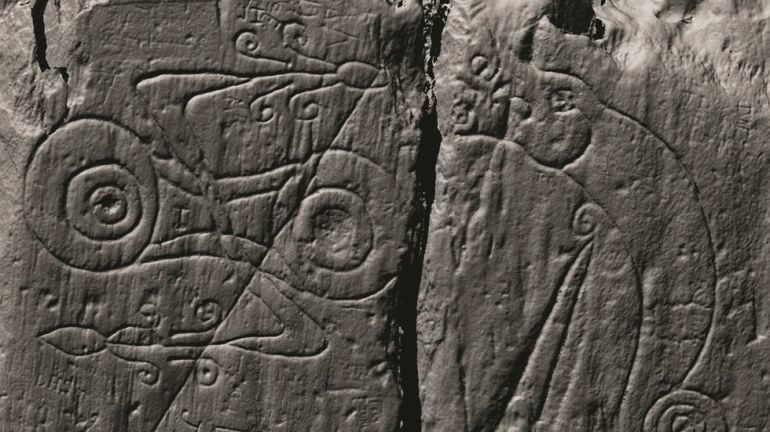 The archaeologists also identified what can be described as a symbolic entrance to the summit of the hill, flanked by Pictish carvings on one side (pictured below) and a substantially big rock-cut basin on the other. Interestingly enough, similar types of entrances were also found almost 180 miles from Trusty’s Hill, at the Dunadd hillfort, which comprised the royal stronghold of the kings of Dalriada. Such discoveries hint at a how the path was possibly used for rite of passage for the early medieval ‘British’ kings (with specific rituals). In terms of more evidences, the researchers found remnants of a large building at the highest point of the summit, and it might have served as the king’s hall. On an adjacent lower area, they also found workshops that dealt in metalwork of gold, silver, bronze and iron. 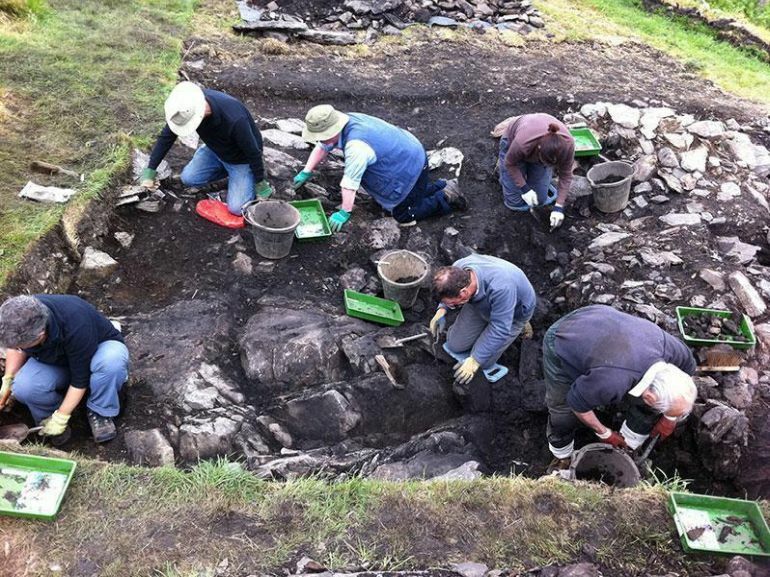 But more interestingly, the archaeologists also unearthed pottery of continental European origin, thus suggesting how the kingdom maintained trade links with their continental brethren as well as Ireland. Additionally, there were also evidences pertaining to wool spinning, leather working and feasting. The household’s wealth relied on their control of farming, animal husbandry and the management of local natural resources — minerals and timber — from an estate probably spanning the wider landscape of the Fleet valley and estuary. Control was maintained by bonding the people of this land and the districts beyond to the royal household, by gifts, promises of protection and the bounties of raiding and warfare. The deliberate and spectacular destruction of Trusty’s Hills is a visceral reminder that the demise of this kingdom in the early seventh century AD came with sword and flame.